TELLURIDE, Colo. - May 3, 2013 - PRLog -- TELLURIDE, Colorado -- Mountaineering documentary "K2: Siren of the Himalayas" will make its U.S. Premiere at the 35th Mountainfilm in Telluride, which takes place Memorial Day Weekend, May 24 - 27. Started in 1979, Mountainfilm in Telluride is one of America's longest-running film festivals. Tickets and information about the festival are available at the Mountainfilm website: http://www.mountainfilm.org/film/k2-siren-of-the-himalayas. Shot in Pakistan in the summer of 2009, "K2: Siren of the Himalayas" stars elite alpinists Gerlinde Kaltenbrunner, Fabrizio Zangrilli, Jake Meyer and Chris Szymiec in a breathtaking high-altitude mountaineering experience. Director Dave Ohlson follows this group's attempt to summit the world's second-highest peak on the 100-year anniversary of the Duke of Abruzzi and Vittorio Sella's landmark 1909 expedition on K2. The film contains rare archive video footage and still photos from this historic 1909 K2 expedition. Fabrizio Zangrilli will be in attendance at the Mountainfilm premiere screening in his home state of Colorado. Gerlinde Kaltenbrunner is the National Geographic 2012 Explorer of the Year and the first woman to summit all 14 of the world's 8,000-meter peaks without supplemental oxygen or high altitude porters. K2 is the second highest peak on Earth at 8,611 meters. It is also one of the most dangerous mountains to climb, with its summit eluding even the most devoted professional alpinists. For every four people who have reached the summit, one person has died trying. Harsh weather conditions and demanding technical climbs have made producing films on K2 extremely difficult, and footage from these expeditions is rare compared to its slightly taller and more frequently scaled counterpart, Mount Everest. 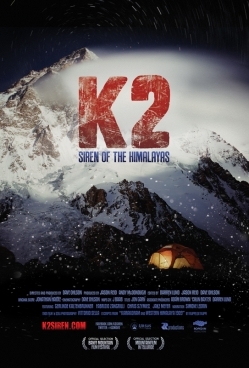 "K2: Siren of the Himalayas" made its World Premiere as a competition finalist at the 2012 Banff Mountain Film Festival in Canada.